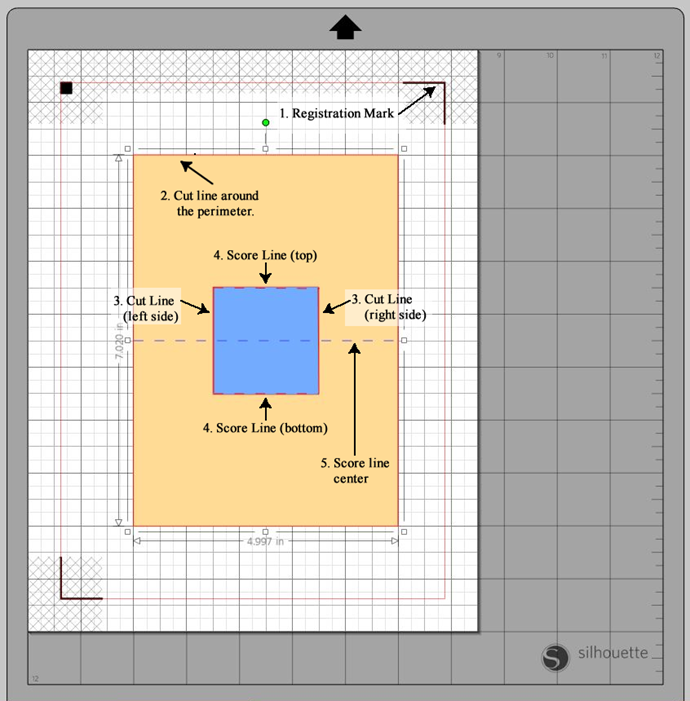 Familiarize yourself with a 2D fabrication program such as Silhouette Studio. Use web-based resources such as the introductory Silhouette Studio You Tube video to review the basic features available in the program. Familiarize yourself with a digital die cutter such as the Silhouette Portrait. Skills acquired should include: (1) the ability to print a design with an ink jet printer (including registration marks), (2) ability to place the printed design on the Silhouette cutting mat, and (3) ability to load the page and fabricate it with the die cutter. Use the die cutter to design and fabricate a three-dimensional mechanism, such as a pop-card similar to those found on Carol Barton’s web site or a mechanical mechanism or automata such as those found on Rob Ive’s web site. Glen Bull, Joe Garofalo, Nigel Standish, Michael Littman, and Matthew Hoffman. FabNet: A Digital Fabrication Network. Two-dimensional (2D) fabrication involves the process of cutting a pattern out of a piece of material. A wide range of materials can be employed. Traditionally clothing is made by cutting a pattern out of cloth and assembling the pieces. 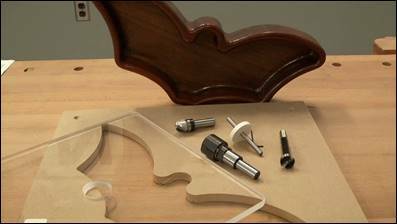 A jig-saw puzzle can be made by cutting out the pieces of the puzzle with a scroll saw. 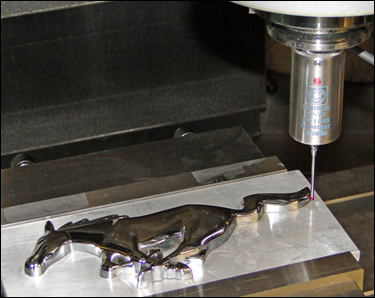 Pieces of metal can be cut out for industrial applications using a milling machine. Craftsmen have employed these processes for centuries. Templates were devised that made it possible to fabricate a pattern multiple times. Many of these historic processes can be seen today at sites such as Williamsburg. Figure 1.1 A template allows a pattern to be repeated. A significant advance occurred in the 1950’s. The process was automated through Numerically Controlled (NC) lathes and routers which allowed patterns to encoded and repeated. The advent of computers in the 1960s led to Computer Numeric Control (CNC) systems. The pattern was encoded in the memory of the computer and sent to the machine. This made it possible to change the pattern by replacing the data in the computer’s memory. However, at a time when computers filled entire rooms, these systems were only employed in large industrial plants. That changed with the advent of the microcomputer. A microcomputer that could be purchased for ten dollars made it feasible to embed the computer in the tool. Today’s 2D fabrication systems come in a wide range of sizes. At the higher end, 2D fabrication systems the size of a house can automate industrial processes by cutting out patterns in metal and plastic. Figure 1.2 A digital die cutter can fabricate a pattern created with the computer. Desktop fabrication systems fall at the other end of the spectrum. A desktop fabrication system is small enough to fit on a desktop. Desktop fabrication systems such as digital die cutters are about the size of an inkjet printer and can cut out materials such as cardstock and vinyl. The advantage of compact digital die cutters is that the computer assisted design (CAD) software used to create patterns for these machines employs the same principles as larger, more sophisticated systems. Further, they cut out patterns quickly, making it possible to design multiple iterations of a prototype in a short period of time. Materials such as cardstock are inexpensive, making it feasible to experiment with multiple variants of a design. The digital die cutter, therefore, provides a good entry point to digital design and fabrication. There are many brands and models of digital die cutters. The Silhouette Portrait is a popular die cutter that is widely used by makers. 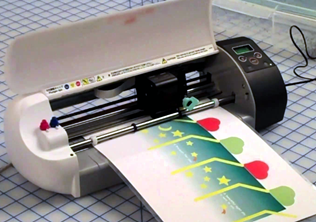 It usually can be found on Amazon for about the same price as an inexpensive inkjet printer and can create patterns in cardstock, cloth, and vinyl. Figure 1.3 The collections of Rob Ives illustrate the potential of paper engineering. Canon’s Creative Park site has a wide range of papercraft designs developed by artists commissioned by the company. These designs can be downloaded and printed out on cardstock. A series of books by Carol Barton provide a useful entry into paper engineering. 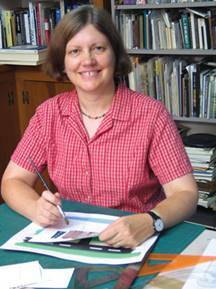 Carol is a professor of art at George Washington University who also has affiliations with a number of museums. The Pocket Paper Engineer books allow anyone to create pop-up mechanisms, beginning with basic mechanisms, and continuing to sophisticated examples. 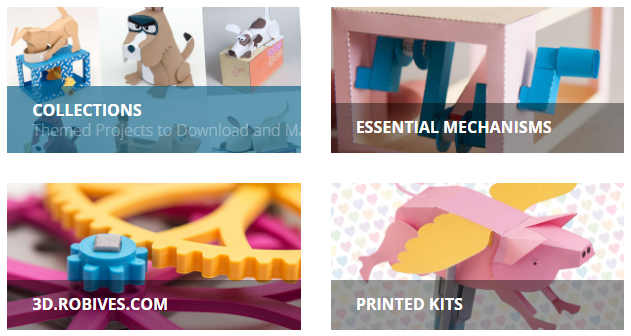 These step-by-step instructional manuals therefore make a good entry point into the world of paper engineering. 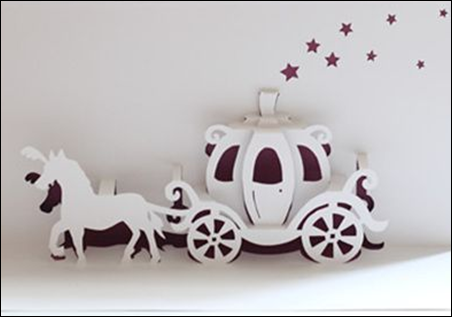 Figure 1.4 Carol Barton is an artist who specializes in paper engineering. One advantage of all three entry points – (1) Rob Ive’s mechanical creations, (2) the Canon Creative Park papercraft site, and (3) the Pocket Paper Engineering series – is that models and examples can be constructed with hand tools such as scissors or an Exacto knife. There are several reasons to begin with hand tools. Hand tools allow anyone to develop expertise with paper engineering without the need for specialized equipment. Beginning with hand tools also provides an opportunity to gain a feel for materials such as cardstock, cloth, and vinyl before automating the design process. Paper engineering is accessible and allows novices to develop skills that are useful in other fields of design and engineering. The sketch of a 2D design executed with pencil and paper can be a useful starting point. Software design programs offer greater precision once a concept has been developed. A range of commercial and open source design tools are available. Generally speaking, these are the trade-offs. Open-source software is freely available. Because it is developed by volunteers, open-source software can be less polished and more difficult to master. Commercial software often – though not always – has a more consistent user interface and a more extensive feature set. This is off-set by the cost of acquiring the software. Silhouette bundles a design program, Silhouette Studio, with their digital die cutters. Silhouette Studio was developed by Nick Sanham. Nick was a nuclear engineer whose first career was in the British navy. After he retired, he began developing educational products, including Silhouette Studio. Silhouette Studio Designer Edition is an advanced version of Silhouette Studio that can be acquired for fifty dollars. This edition offers upgraded capabilities, such as the ability to import a range of formats into the design program. Silhouette also offers a plug-in that allows Adobe Illustrator to connect to a Silhouette die cutter. For anyone who is already using Adobe Illustrator (typically artists and graphic designers), this plug-in allows them to use Illustrator as a fabrication program. The faculty and staff of the Curry School K-12 Engineering Design Laboratory are collaborating with Peggy Healy Stearns, an educational software designer, to develop a fabrication design program for children, Maker Studio. Peggy previously developed Diorama Designer and Community Construction Kit. These programs allowed children to design papercraft dioramas and villages. Figure 1.5 Maker Studio is a fabrication program designed for children. 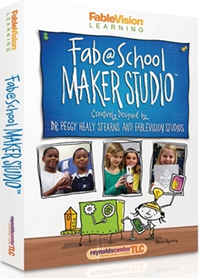 Maker Studio, distributed by FableVision, is designed for students in grades four through eight. It is currently an evolving program with some bugs and glitches that are being addressed as the product matures, but is a promising example of the potential of the field. Fabricating a pop-up card is a straightforward initial fabrication project. 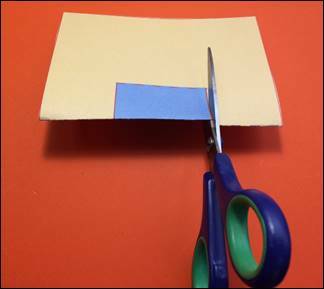 To get a sense of the possibilities, begin by cutting a couple of slits in a piece of folded cardstock. Figure 1.5 Cut two slits in cardstock to create a pop-up card. Once you have cut two slits in the cardstock, crease and fold it to make a pop-up card. 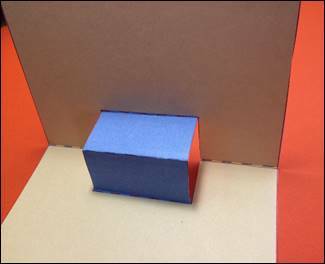 Figure 1.6 Fold and crease the blue pop-up box. (c) cut edge, (d) perforate, or (c) perforate edge. (The “cut edge” option cuts along the outside of the line rather than the center of the line. Figure 1.7 Recreating the pop-up design in Silhouette Studio. The file for the design shown above (Figure 1.7) can be accessed through a link under “Resources.” For detailed instructions depicting menus and tools in the software that are used to create cut lines and perforation lines, refer to the tutorial referenced under “Resources” (above). In this instance, the pop-up card can be fabricated just as quickly using scissors. However, once you have familiarized yourself with the basic capabilities of the design program through this project, you can create intricate designs that would be difficult or impossible to create with hand tools alone. For example, the Cinderella coach below (Figure 1.8) employs the same basic technique with a more intricate shape. Figure 1.7 This extension of the basic pop-up technique has a more intricate shape. Another variant of the method makes use of pop-up letters to create a message. In this instance (Figure 1.8) cardstock of one color (orange) has been folded within a second piece of cardstock (yellow) with a contrasting color. 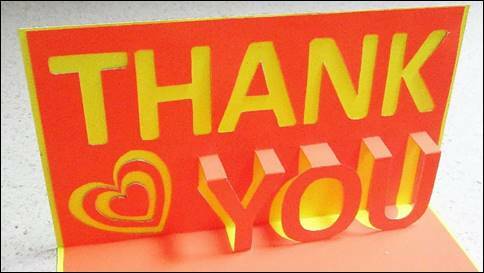 Figure 1.8 Pop-up letters can be used to create a message. The CAD design methods developed through practice with the digital die cutter can be applied to more advanced fabrication systems described in the section that follows. A 2D digital milling machine uses a rotating drill bit to rout out patterns in metal or plastic. These systems are more complex to use and require specialized software. The drill bit can break if the speed of the bit is not adjusted for the type of material being used. These 2D CNC fabrication systems are used extensively in industry, but currently are only found in advanced or specialized makerspaces. Figure 1.9 A 2D milling machine can rout out patterns in metal or plastic. A laser cutter is similar to a digital die cutter, but uses a laser in place of a metal blade. Laser cutters are extremely versatile and useful, and are easy to use. At the present time they are expensive, and can cost ten to twenty thousand dollars to acquire. Therefore they are typically found primarily in secondary schools and community colleges. Figure 1.10 A laser cutter can cut or engrave wood or plastic. However, they are so useful that they are used extensively in the Laboratory School for Advanced Manufacturing (Lab School). They proved to be so useful that all of the middle schools in the Charlottesville and Albemarle school systems (home of the Lab School) have now acquired laser cutters. 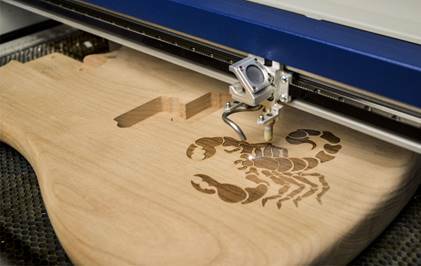 Laser cutters can quickly cut out designs in cardboard, wood, or plastic. A two-dimensional design that might take an hour to fabricate with a 3D printer can be cut out in less than a minute with a laser cutter. This can make generation of a class set of a materials for many activities feasible. This utility can justify the initial high acquisition cost. As the cost of laser cutters decreases in the future, it is likely that more schools will acquire them.